Rail travel has been a core method of public transport since the 19th Century. Once a technological marvel, the railways “set the town of Britain a-dancing”, sparking a revolution and transforming how people both travelled and transported goods across the country. Since then, however, the railways have not changed much in terms of service or infrastructure since the Victorian age, and “for a long while yet”, public perceptions have been that the railways are outdated; unable to keep up with the velocity at which technology has progressed, and reluctant to change. This is partly due to the unprecedented rise in smartphone adoption over the past decade, coupled with the explosive demand of the Internet of Things (IoT) more recently. How passengers engage with transport has changed entirely, with on-demand culture now dictating how the transport sector will function in the years to come, if it is to remain competitive. These catalysts – the smartphone and the Internet of Things – set about the improvement of life, health and work in modern society, by ensuring connected systems and sensors can gather, analyse and visualise data. 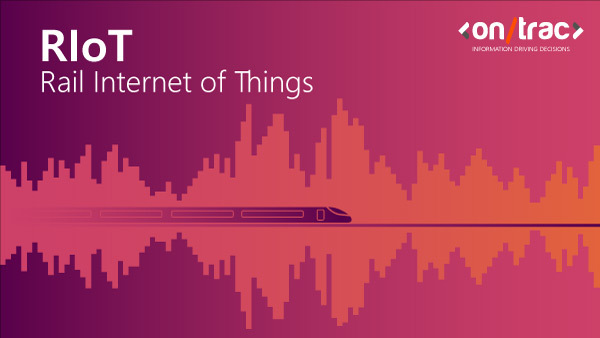 In the rail industry, the Rail Internet of Things (RIoT) has advanced, taking machine-to-machine (M2M) connectivity one step further, placing rail in the precipice of another industry-wide revolution. The rail industry’s workforce was, arguably, the trigger behind digital reform in rail. Harnessing the power of – once prohibited – smartphones and tablets on site, workers can now not only communicate and collaborate with one another from anywhere in the network, they are able to make better use of the masses of data in rail too. As a result, the workforce can now carry out work more safely and efficiently than any other time in rail history. Similarly, the transformation in passenger demand has been triggered by the widespread adoption of smartphones. This, in turn, led to the disruption of the entire transport sector, with Uber’s transformative business model disrupting the status quo, and setting the standard for modern travel. It is now time for the rail industry to catch up and harness the full potential of the Rail of Internet of Things (RIoT) to ensure that the level of connectivity being seen across the workforce, is extended to the passenger experience to “set the towns of Britain a-dancing” once more. The official launch of the Digital Railway in early May, reinforces both the government and Network Rail’s commitment to digital reform. The creation of new – and updates to existing – routes mark the largest transformation to the UK rail network since the Victorian age; both these upgrades to infrastructure and investment into technology will play a vital role in restoring passenger confidence. Data-driven technologies, such as modern signalling and train control software are being implemented to streamline the network’s infrastructure, improve the quality and quantity of journeys and enable a solid move towards a more predictive approach to maintenance and operations. The successful acceleration of this technology will benefit both passengers and the workforce simultaneously; facilitating the ubiquitous connectivity of trains, workers and passengers alike. That’s not to say the Rail Internet of Things is not already making an impact on passengers; both the rail industry and the Department for Transport have been committed to finding new ways to streamline the passenger experience, using the convenience and flexibility of smartphones and their subsequent apps for quite some time. For example, last year, the government invested £80million into a programme aiming to deliver smart ticketing options across England and Wales by the end of 2018. Smart ticketing – a digital alternative to traditional paper ticketing – is a means of placing passengers in more control of their travel options and journeys. 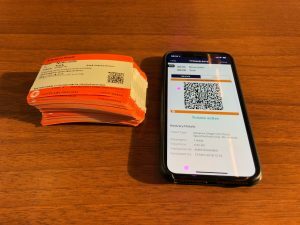 Stored via an app on customer smartphones, the benefits of smart ticketing is wide-reaching, solving a number of ticketing troubles in transport, including split ticketing. Improving the convenience of ticketing options by allowing passengers to pay online – within an app – makes digital ticketing a far quicker and easier to use option than the relatively laborious alternative of printing out tickets at a station. For a few years now, smart ticketing has been an option for passengers travelling via bus. Digital tickets, such as The Key or Swift Pop have been used to provide competitive bundle and pay-as-you-go travel options with much success. In rail, passengers travelling on most of the Thameslink, Southern and Great Northern networks are using a similar system, in the form of a contactless, pay-as-you-go travel card, KeyGo. This allows passengers to travel more flexibly, charging them a specific amount per journey, with the added bonus of automatic compensation for delays of service of 15 minutes or more. If this system was available on passengers’ smartphones, this would reveal a plethora of Rail Internet of Things opportunities for the rail industry to take advantage of. The data that can be captured and analysed from a smart ticketing app, coupled with the trains they are travelling on, could facilitate a greater understanding of how people are travelling across the entire rail network. This would enable train operators to respond more readily to passenger demand and adjust their service – where applicable – to ensure passenger satisfaction. The collision of the Rail Internet of Things and big data already at the industry’s disposal – alongside new data soon to be captured from on-train sensors, trackside signals and indeed, smart tickets – could further support the industry’s ability to manage its capacity. What’s more, by having systems and processes in place that can, not just gather and analyse, but utilise this data to become more predictive across the whole network could – and perhaps should – mark the first step in the direction of intermodal travel here in the UK.